The LUNA 2 Professional is a powerful cleansing device designed to give you a daily, professional-level mini-facial in the comfort of your own home. The second-generation device boasts a system with 2 motors that are both 2x as powerful, and a brush surface made with longer and softer touch-points. This unique duo makes the LUNA 2 Professional ultra powerful, yet still gentle on the skin. The medical-grade, non-porous silicone resists bacteria build-up, making it 35x more hygienic than standard nylon brush heads. Featuring our most powerful technology yet, the LUNA 2 Professional uses alternating 2-point transdermal sonic pulses. 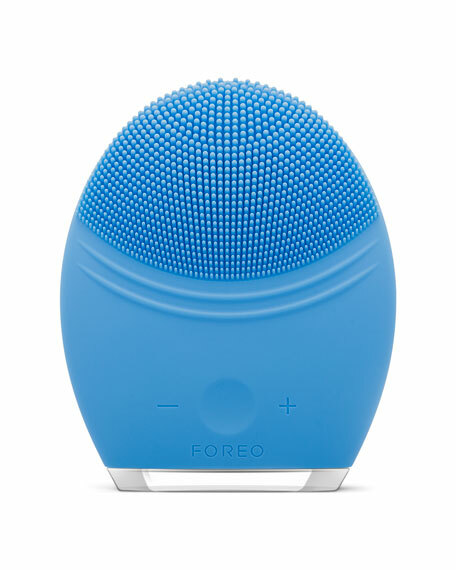 These gentle pulsations are channeled through the 4-zone brush head that is suitable for all skin types, unclogging pores of 99.5% of oil, makeup residue, and dead skin cells. With two motors each generating up to 8,000 pulsations per minute, this innovative device helps removes all of your skin's impurities. The LUNA 2 Professional features an Anti-Aging Mode that channels lower-frequency pulsations directly onto wrinkle-prone areas, diminishing the appearance of fine lines and wrinkles, leaving skin looking radiant, smooth, and youthful. Providing an essential step in any facial care routine, it cleanses in a way that protects the skin's natural moisture barrier. Twice daily use will reveal healthier looking, more radiant skin while enhancing the penetration of your favorite skin care products.